Gran Turismo Sport update 1.02 is now available for download. This day one patch is around 12GB in size. Accroding to the Gran Turismo Sport patch notes, all car data is updated in order to support rain conditions. In addition, Polyphony Digital has made several tweaks to level design as well as fixed several bugs. The reward sequence is also now updated. Read more details below. Update: Polyphony Digital is planning to provide more online features for Gran Turismo Sport. 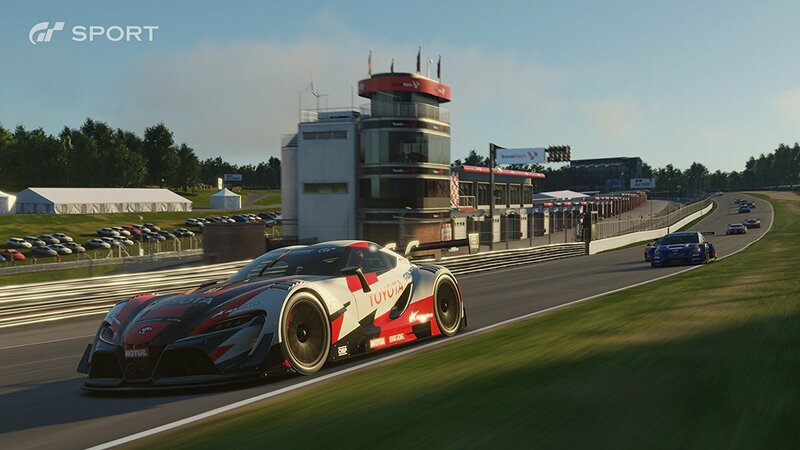 These online features include ‘My Profile’, ‘Activity Feed’ and ‘Discover’, as well as ‘Decal Uploader’, which allows you to upload decals made by users to be used within Gran Turismo Sport ‘Livery Editor’. According to the game developers, in order to maintain a good gaming experience by alleviating extreme server loads immediately after the start of the service, they are planning to release these online features gradually. Gran Turismo Sport’s Scapes Additional Content Pack (free) which adds photo spots to the ‘Scapes’ photography feature will begin to roll out in Asia and North American Region on Oct. 17. This free pack will be available in European Oct. 18. Additionally, for customers who have pre-ordered the game and downloaded it through the automatic download, may take additional time. All car data is updated in order to support rain conditions with Gran Turismo Sport 1.02. Several tweaks to the level design. The reward sequence has been updated. Gran Turismo Sport 1.02 fixed several bugs. When the save button is pressed to save, there are cases in which the transmission to the server fails. This can be alleviated by playing the game for approximately 15 minutes after starting the game. When the email address is repeatedly deleted, the game stops. In “Email address” of “Options,” if the “Delete Email address” action is repeated, the game comes to a stop. The game freezes when participating in a drift trial using a car with a custom color chip. If the exterior is edited in the livery editor with a custom color chip and the player participates in a drift trial, the game freezes after displaying the results. On the Thrustmaster T500RS steering controller, we will correct the issue where there is excessive vibration when turning the steering wheel over a certain amount (causing understeer). We will increase the steering speed on the standard DualShock 4 controller to improve controllability while oversteering and drifting. Check your game update and download latest Gran Turismo Sport update 1.02 on your PlayStation 4.